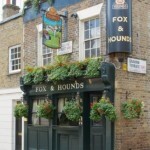 The Fox and Hounds is a delightful small traditional London pub built back in the 1860s to serve the working people that lived in the cottages nearby. Times may have changed but the Fox and Hounds is still here and very much still a favourite of all those living nearby. The Fox and Hounds prides itself on having no TVs, no music, just lively conversation and great people. With an abundance of bright pink and red blossoms tumbling out of hanging baskets outside, it’s easy to spot this lovely pub in a quiet backstreet. They even have a small garden with wooden tables and benches at the back, making this the perfect hidden sport to sample a few real ales. Close to Liverpool Street station and tucked away down Artillery Passage, the dark wood panelling and hessian-clad walls here are reminiscent of an old ski lodge, with its cosy nooks and crannies and comfortable seating. Their eclectic inventory of wines from old & new worlds is impressive and the menu is top quality Brit classics. The Museum Tavern in Bloomsbury is a quintessentially British Pub situated just opposite the British Museum. This cosy and elegant pub is a slice of culture itself and was the work of architect William Finch Hill. With its burgundy-coloured seating, wooden floor, vintage Nicolas posters and uncluttered interior, this is a stylish place to enjoy a glass of wine with friends after work. With around twenty to order by the glass or three hundred by the bottle, the knowledgeable staff can advise on the best wines to suit your palate. Located on the historic Royal Hill and just a stone’s throw away from the centre of Greenwich, The Richard 1st is a pub that’s been at the heart of the local community since 1923. They love welcoming neighbours and tourists alike to enjoy delicious food, great drinks, a wonderful atmosphere and friendly service. To the rear of the pub you’ll find their stunning Conservatory, a relaxing drinking and dining space showered in natural light throughout the day. Beyond that you’ll find their beautiful garden, the perfect place to relax and unwind throughout the summer months. This pub has won many awards, both for its real ales and its seasonal turkey and cranberry pies. If you enjoy tasting different hand-crafted beers, this is the ideal place to bring your friends. Good Real Ale was served at The Charles Dickens since the early 19th Century and today they offer a selection of six Real Ales from Scotland, Wales and the West Country, changing daily. The cosy, rustic atmosphere of the warm and welcoming interior also encourages you to indulge in the delicious à la Carte menu for lunch, dinner and Sunday Roast. The menu changes along with the seasons, and is freshly prepared by Chef Murilo. The Churchill Arms was built way back in 1750, making it one of the older, more historic pubs in London. In the 1800s, Winston Churchill’s Grandparents were regular visitors – which eventually led to the naming of the pub after World War 2. Step inside today and you’ll find plenty of Churchill memorabilia hanging from the walls. The pub has other claims to fame too, and is known as the first pub in London to serve Thai food.